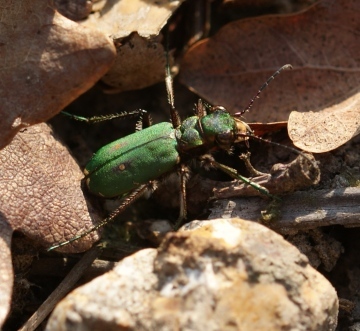 The Green Tiger Beetle is rare in Essex. Nationally it is found in areas with bare ground or sparse vegetation such as sandy heath, moorland, clay pits and quarry spoil heaps, always in sunny situations. Adults are active in early summer and will often take to the wing when disturbed. Both adults and larvae are predators on other invertebrates. The larvae form a burrow in the ground, often on or near paths. Widespread and common in some areas, very local in others. It is a good indicator for heathland management.